Have you registered yet? Do you want to know the secret to stress-free registering? Check out my post about me and The Mister’s registering adventures. It went surprisingly well due to a wonderful combination of planning and caring more about the generalities than the specifics. Check it out! That’s The Mister’s hand…and no we are not registering for the Slap Chop. I actually had a friend tell me that I shouldn’t register with The Mister, but rather take a friend or my mom…she said everyone always gets in fights. Well, we haven’t gotten in a fight, it’s pretty fun actually. We work pretty well together…I’m the organizer and he’s the shooter. 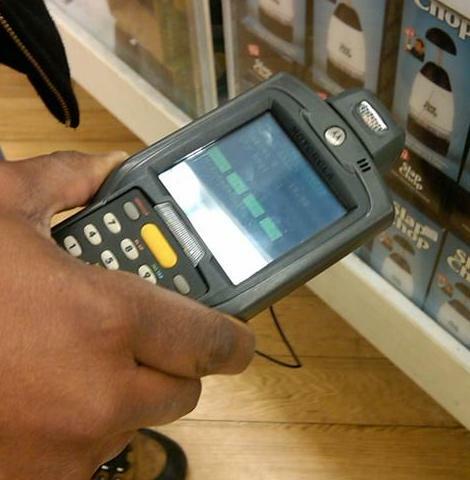 I quickly scan the store with my keen shopping eye (LOL!) and pick three options, like “which do you like better…that one, that one, or that one?” He says “that one”, I say “shoot it!” and we move on. We did that with everything…from fine china to candles. I’ve got a fun picture of him holding up a Sham Wow box…I put it on our wedding website. So I apparently have the secret to stress free registering, so I’ll fill you in. First, I came up with a plan. Macy’s for fine & everyday china, luggage, and nicer kitchen items. Bed Bath & Beyond for towels, sheets, pots and pans, kitchen gadgets and the Jack LaLane juicer that The Mister insisted on putting on the list (*sigh*). Target for electronics, storage items, a grill…but don’t get me started on Target! Just tried to register there and the stupid scanner gun didn’t work, there was a dude passed out in the front and The Mister was a good samaritan and asked if he was okay and he’s like, “don’t call 911…I’m a bum!” Ooookay. Suffice it to say we’re going to a different Target on Sunday. We didn’t double register for items even though the lady at Macy’s and the dude at BB&B (who was waaay too attentive) kept pitching their stores as the place (we’ll match their price or we’ve got a 20% off coupon)…this has kept our registering trips short. Also, we signed up for a honeymoon registry where you can have people sign up to buy certain parts of the ‘moon. Like, someone could buy us a couples massage or a happy hour…pretty cool. Anyhoo, it’s been fun and cool to get to know the things he likes and to know that we can work well together.